This initiative is an opportunity to discover and harness integral, on-reserve economic information typically available to only municipalities. Employment and Social Development Canada (ESDC) has selected a few partners across Canada including the Anishinabek Nation ASETA (Aboriginal Skills and Employment Training Agreement) holder and Anishinabek Employment and Training Services (AETS), to participate in the development and implementation of this Pilot Comprehensive Community Skills Inventory as well as Labor Market Study and are providing some of the funds necessary to start to implement it in communities. 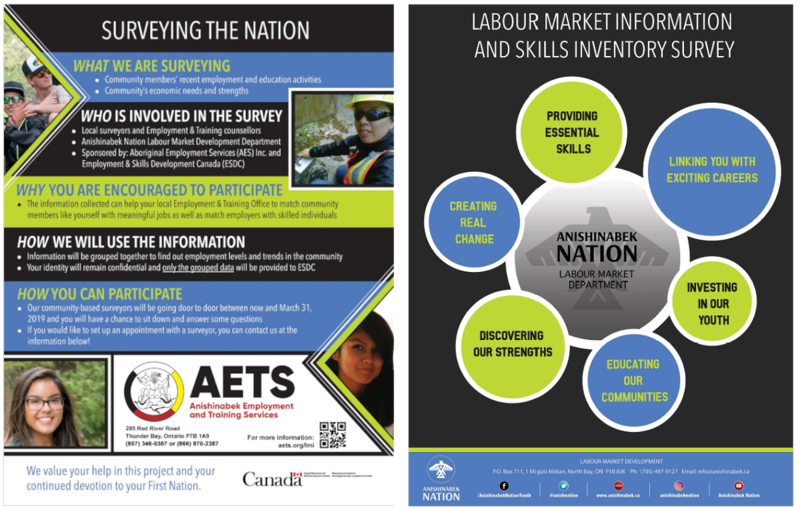 On-reserve Labor Market Information (LMI) is key to taking control of our program design, service delivery and decision-making in First Nations employment offices such as AETS. There is somewhat of a shortage of data pertaining to skills and training needs, employment experiences, and educational and skill profiles of Anishinabek citizens. AETS will be utilizing the funds allocated to this project, as well as the resources currently available to us, to fill the gap in information and technological infrastructure capabilities. The key objective of the LMI Project is to improve labour market information by supporting First Nations communities in their labour market planning and service delivery. While the Anishinabek Nation ASETA and AETS support First nations communities’ operations and service delivery, it has lacked the funding and infrastructure to implement a project to obtain an adequate level of labour market information. AETS will use the information collected in the next three years (by March 2019, March 2020 and March 2020) to understand the needs of the communities and paint a picture of their economic states. While ensuring that all personal information remains secure and belongs to the First Nation. AETS has obtained approval and input from First Nation leadership to ensure that AETS is capturing information relevant to the community and hiring on-reserve survey takers. AETS looks forward to each of its nine member community’s participation in the Labour Market Information Pilot Project, and for involvement to evolve the project in the way that best services the community.